OK. Right off the bat, it would probably be better to set expectations. This does not replace email. This does not make the underlying issues about email and the tonnage an average user receives in one day just go away. Having said that, the new Inbox app does seem to be a better way to triage your mailbox. 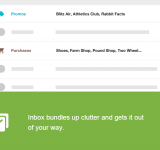 There hasn’t been time to really get to grips with how inbox works, so this is just a quick overview. At some point, if Inbox really clicks, there’ll be a more comprehensive review. This is so anyone reading this can see what they’re about to get and understand whether they’ll want to give it a try. You may be perfectly happy with what you already have. As mentioned in our previous post, Inbox is still in invite only mode, and no, we aren’t able to give out invites, so please don’t ask. You know how Google works. Step One is to actually request an invite here. 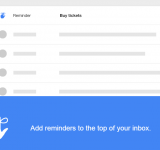 Inbox is available on iPhone, Android and the web so for the sake of expediency, I’m reviewing how its used on the web… and first things first: It looks different. Really different. 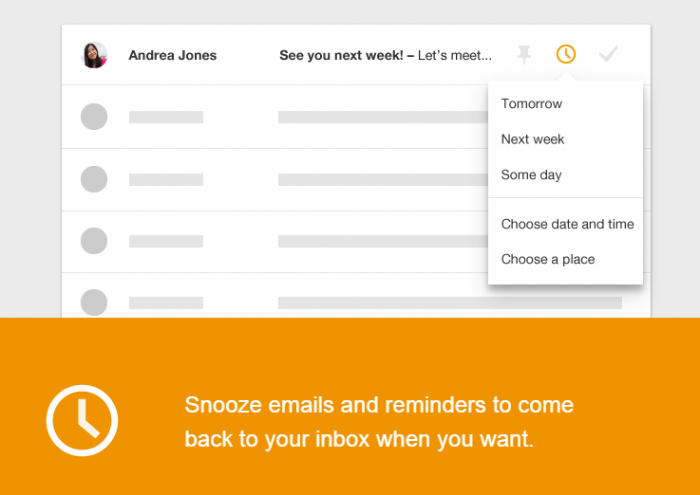 At first glance, it feels a bit like a mash-up of Google Now and Google+, but for your email. 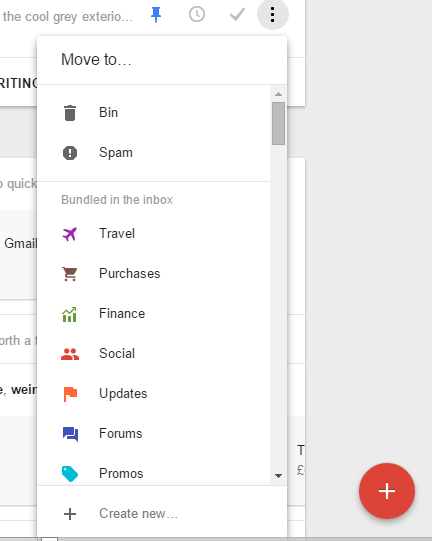 The layout is a lot cleaner than gmail which is surprising, and that cleaner look continues with both the Android and the iPhone version. The first thing you see when you load the app is the welcome screen which walks you through the highlights of the app – about snoozing, setting reminders and the list of new actions… not the least are Bundles. Think of them as the categories in your standard Gmail – like promotions, forums and social, but having been on a week long binge with the Redbull. It took those ideas and went to warp factor 5. 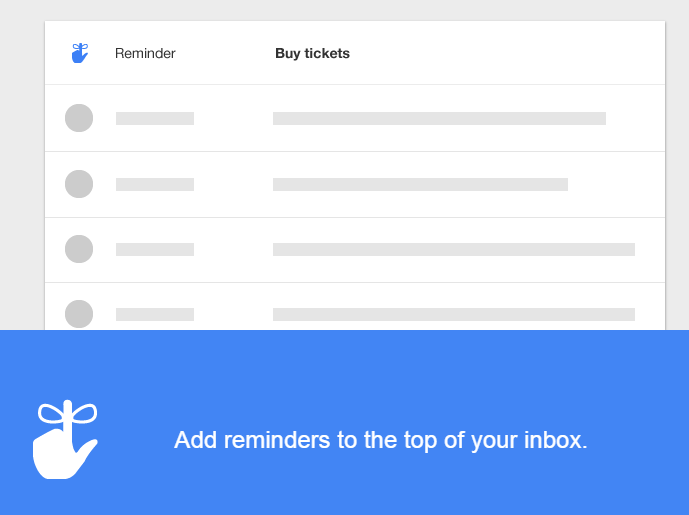 As previously stated, the jury is out on how useful it will be, but the tools are there and as we know Google will iterate and the Inbox will learn how you work. 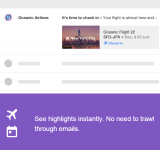 Google’s already produced a video to walk you through the idea of the new app which is nice way to introduce yourself to your ‘new’ way of getting on top of your mail. Going back to the theme about triaging your email – that is dealing with the things you need to deal with right now, parking some of the things you can deal with later, and getting rid of the cruft. 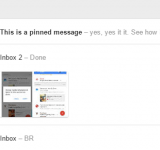 In this case, Inbox has taken a page out of Mailbox’s playbook (for those with an Android phone, you aren’t left out any more, as there’s an app for that too). 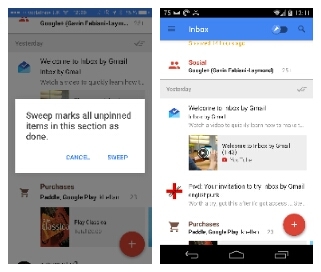 Swipe a mail to the left, and you get to snooze. 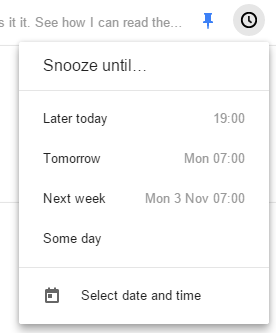 You also get to choose how long you want the message to be snoozed for. There are automatic actions such as later, or tomorrow morning. Maybe there’ll be a way to further tweak what later or tomorrow means, as right now the defaults are for 7pm for later and 7am for tomorrow. You can Swipe to the right, and its equivalent to saying ok – it’ll no longer be in your list of stuff to deal with. I’m guessing it does the equivalent of archiving, but we’ll see when we get into it later. 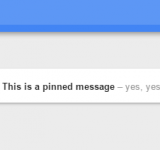 There’s also a ‘pinned’ mode that you can do on any individual mail. Think of it as the “I don’t want to lose this message” filter. Right at the top of the screen, there’s a ‘Pinned items’ button which looks amazingly enough like… a pin. Flick it on, and only your pinned items will show up. Another nice touch is that you can read the first line without opening the message so you can deal with things at-a-glance. At the bottom right of your app (or web view), there’s a red plus button. Hit it, and you get the options of composing a new mail, setting a reminder, or instantly emailing some of the people in your mailbox. It either grabs the three people you email most, or the ones you’ve been talking to most recently. Again, it will take a little while for all those answers to become apparent. At the top of the screen, there’s what’s called the sweep button. It means that anything you have on the day you’re working on (just that specific day) can get marked as Done and away from your Inbox screen. The only exception to this will be the items you’ve previously Pinned. 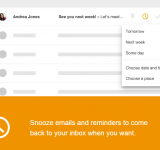 Its a nice touch and probably will be more useful as the Inbox workflow gets incorporate into daily usage. The exception to this is if you’re looking in a bundle. You can then sweep the entire bundle away, so make sure you know what and where you’re sweeping. It looks really slick. It’ll be interesting to see whether this genuinely is a functional alternative to the traditional view, or merely a complement to perform those triage tasks. The one thing that seems to be missing is an easy delete function. Most of the mail I get rid of, I don’t want to archive, or move, tag, label or anything else. I want it gone. There’s a way to do it on the web, but that option should be surfaced as an immediate one-click/swipe type of action. And why is there no option to delete on the phone? That’s just crazy talk. The other thing that needs to be kept in mind is the Sweep function. 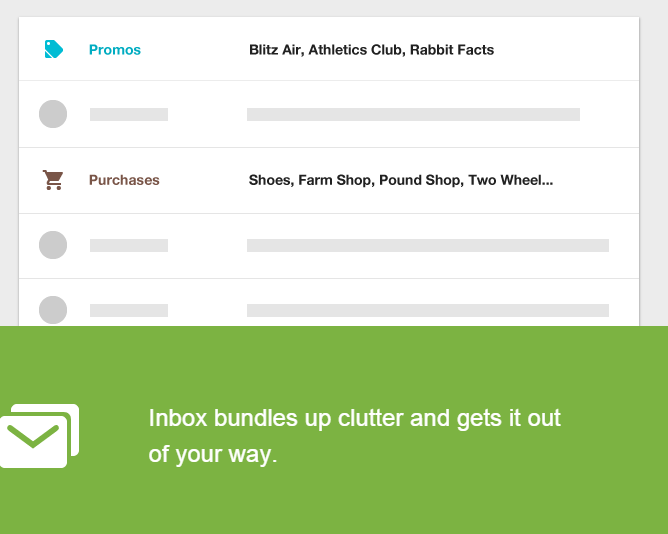 If you’re just looking at your inbox, then it will sweep just the days worth of stuff, but if you’re looking at a bundle, it seems to Sweep the entire thing. Just remember that you aren’t deleting, you’re moving stuff into the ‘Done’ label, which you can look at later… but apparently only on Inbox. When you’re back in your normal web view, those Done items don’t seem to be in a folder. They are though – if you do a search in your mailbox under the Done filter, like “Rumplestiltskin in:done”, they’ll show up. The problem is there doesn’t seem to be a labelled filter anywhere. Its acting a bit like Google Keep. It’s in your inbox, but kinda not-really-maybe. Frustrating. There’s a lot packed into Inbox. Its a bit like a Samsung phone in a lot of ways: that you can keep what you want and throw out what you don’t want to use. Its also like iOS in other ways. It seems simple and relatively intuitive, but with a lot of functionality under the hood if you search for it. 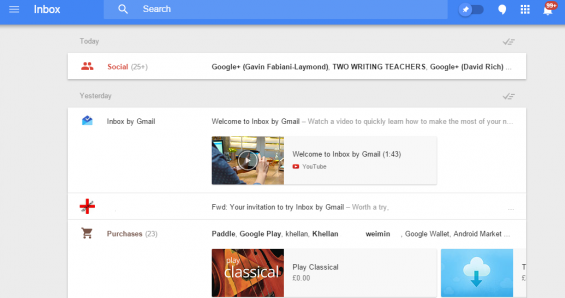 Right now, Inbox isn’t available for Google Apps for Work, or Google Apps for Education. The guess is that this may be because of commercial agreements that have to be hammered out, but again we shall see. Maybe its just that the Googleplex wants to roll Inbox out slowly and make sure the major bugs are ironed out before they give it to paying customers. In any case, there’s no reason to think it won’t arrive sooner rather than later, but always on Mountain View’s timetable. You want a serious amount of online storage?